was scheduled for 7 AM. hair tickled his hand, and he said quietly, “I’m gonna miss you. 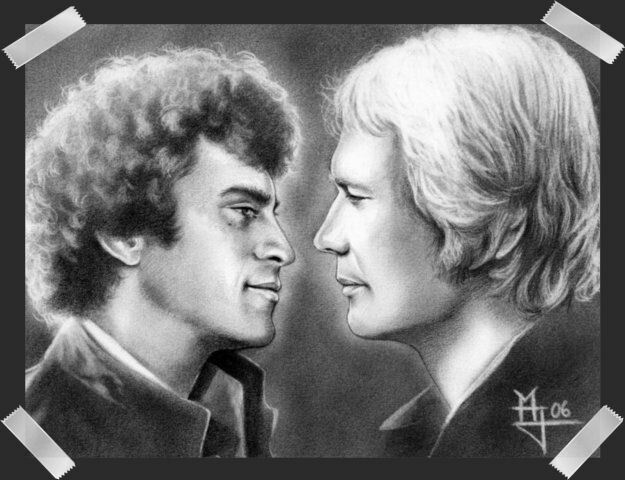 Starsky looked ahead -- he hated the moment of saying goodbye to Hutch. moment he was grabbed and his mouth claimed in a fierce kiss. instant -- then he was gone. lips on his, and it made it even harder to be alone. he would fly over to be at her side. “Why has this to happen just before Christmas?” Starsky had complained. love to him until nothing else had mattered in Starsky’s world. through the suburbs of Bay City to Parker Center. looking first. Starsky cursed -- that had been way too close! girl, about 16 years old now. Straightening in a defensive posture, the girl looked the other way. looking at Starsky more closely now. Lizzy dared a look at Starsky then, casting a shy smile. see the disabled kids Terry had so cherished all those years ago. easier things seemed now. He smiled, driving on in his reverie. it was becoming a wasted effort, he knew. one day that part of his being was gone. his feelings, and remained silent and brooding, even with the blond. together in front of a Monopoly board on Starsky’s kitchen floor. into his apartment that night. although Terry was gone his best friend was still by his side. following morning holding each other in the arms of their love. was still another great love in his life. Metro headquarters, forcing himself back to reality. "As he made his way through mundane paperwork, and missed his partner’s help with typing, Dobey strode through the room several times. envision the “wrestling match” that ensued between them even now. he’d been having but knowing the moment had been spoiled anyway. come home to arrange everything for Christmas. had arrived safely but was still at the hospital with his father. Precinct and walked to his car -- alone. could really work with the kids again, he pondered, getting ready. Terry would have liked it, that he knew. the boy to fetch the leader of the group. of young people, she announced, “This is Dave Starsky. We met today. to force the grim memory away. lose against these disabled young people. love it!” He was already rolling up his sleeves. to attempt more complicated forms. Only then did Starsky realize he was grinning like a Cheshire cat. She smiled at him trustingly, and leaned against him. “I like it here. how that soft voice could still turn him on. towel his thick curls dry and missed Hutch’s next words. himself to get serious again. side and seeming to relish all she could learn. cartoon marathon, good-naturedly complaining the entire time. That was love, Starsky mused, smiling. How lucky he was. “Are you happy?” Lizzy snuggled up to him and he hugged her close. “Thanks. I’ve enjoyed it.” He squeezed Lizzy’s hand. “See ya, Lizzy. -- it came that night in Hutch’s phone call. half of his soul had been missing the entire time Hutch had been gone. presents he had trouble pushing the doorbell. and would give her his present personally. kit to make a necklace by herself. hard to bear, that he knew. looked at the nurse again. on Starsky as the Dr. spoke. and bring her a gift.” He raised the small box in his hands. table and plastic chairs, gesturing for Starsky to sit down. “I want to know what’s wrong with Lizzy,” Starsky stated flatly. ward, mulling over everything in his mind. Tuberculosis? he pondered. make Hutch a guitar ornament just a few days before. the blond who meant so much more to him than a mere partner or friend. list as he came whistling through his apartment door. could hardly wait to get started shopping early the next day. when his aching head protested the sudden movement and hurt even more. little better and climbed back into bed, his watch reading 3:02 am. over his face and realized he was sweaty too. of his thoughts. What if I’ve got it too?! partner and finally fell into a restless, light doze. Carter case that was still unsolved. more information about Lizzy’s disease. as he began to read. was so lost in his thoughts. hand over the agreed-upon $20 and watch him leave. His heartbeat already racing, Starsky felt sweat trickle down his face. and there was nothing he could do to avoid the progress of the disease. would tell his partner once he’d arrived. he’d be well enough to go anywhere. like it even half as much as he thought. as he sank down in a chair to wait for his friend’s return. lover’s face more than anything now. “Good to have you back!” Starsky beamed, already turning. files he hadn’t quite gotten too. He never allowed Hutch to say a word. determined to find out what that “something” was. but acutely aware of his partner’s taut nerves. reddened even more as he hurried back to his coffee-making task. Hutch being home. The blond had no idea why. to pull him close -- he was stunned when Starsky jerked away. heavily toward the living room. but to keep Hutch away. time, before Starsky could move, Hutch snatched it up. slammed his way out the front door. he was infected with a contagious disease. up to him and he had hugged her was like a firebrand through his heart. would grow up without him and he would never know how she was. Starsky’s thoughts rambled through his fever-ravaged brain. flowing onto the cushion beside his cheek. ... he must be sicker than he thought. “Hutch, I’ve got active TB like Lizzy. on his partner, scanning the flushed face. and turned his face to the back of the couch. hips, then to the inside of his thighs. beloved features. He closed his eyes. reached out for Hutch’s extended hand. lover’s arms with a soft sigh. Hutchinson he was living with Starsky in a committed relationship. see it at all the same way. where his partner sat unsteadily on the table, trying to get dressed. He looked pale as he struggled with his shirt. Starsky’s nod before he stepped up to help his friend into his clothes. some time ago. And a tiny bit of congestion here on the right side. pneumonia you should stay home and get some rest for the next few days. thanks his prayers were answered -- his partner really would be okay. recovered from her bout with TB and was back to a normal life. However, he pondered, perhaps they could visit her during her recovery. he found himself grabbed in a fierce hug. Hutch’s rough cheek then let him go. Starsky forgot about his bad cold and how feverish he still was. instead he was smiling happily. way out of bed the next morning to get dressed. “Hutch, we still need to buy some things for tonight,” Starsky argued. that would keep him warm. initiating a debate about how healthy a Christmas meal should be. prescribed were definitely helping him. washed and then tucking him into bed. Starsky frowned, trying to remember. Had they made love to each other? No, he must have fallen asleep soon after Hutch had joined him in bed. chance to get the present out of the car. outside all day. “Yeah, we’re getting old all right,” he grumbled. wearing himself out. His partner was a born caregiver, Starsky mused. forced to realize not everyone wanted his help. Startled, Starsky jumped as he turned from the window at the words. than when Hutch had left. as he brushed past going out the door. Starsky went nuts as they passed one of the big malls while on patrol. might be now without his courageous friend. He was jolted from his reverie by strong arms wrapping around his waist from behind. For just an instant a wet tongue snaked into Hutch’s ear. “You ready to buy a huuuge Christmas tree?” Starsky asked. bouncing partner out the door. delivered within the next hour. at the next intersection, turned around. Starsky’s present. He was relieved when Starsky only nodded and smiled. large kept Starsky silent all the way back to his apartment. parked, pointing to the young man waiting at the foot of his stairs. trees’ alignment and went into the living room. “There! Perfect!” Hutch announced finally. Tilting his head, the blonde was still focused on the tree. cheek before he left the room. blinked, unable to believe his eyes. He had never seen such a beautiful sight. his partner had heard his call. much-needed rest and awake to his beautiful surprise. the upper part of the tree, easy to see at Hutch’s height. rang it, but the sound didn’t reach Hutch. smiling as Hutch turned toward him, surprised. through it as he came up to his friend. Starsky thought Hutch’s smile had never looked so beautiful. it was too early for exchanging gifts, and patiently crossed his arms. “Then let me get mine for you too,” Hutch insisted, and hurried away. “Hot,” Starsky whispered, watching the necklace pass by in the moving tree. gazing up at his partner, stunned. to Hutch on the floor. him with a longing expression, melting Hutch’s heart. feather-light kisses on Hutch’s forehead, then on both cheeks. neck. He inhaled the familiar scent and moaned. arms and helping him settle on the soft comforter. full of love -- and Starsky knew it was all for him. Starsky even closer, running his hand over the soft dark curls. bad memories go away.” He paused. kissed the palm. He cleared his throat and toyed with Hutch’s t-shirt. chest and curled around the springy ones. this.” He laid a light hand over Starsky’s strong heartbeat. swift movement Hutch got rid of his shirt. loving the sound when Hutch moaned in response. position then pulled Starsky on top of himself. “Hey, you’re heavy. - I love it.” Hutch didn’t let Starsky draw back. shifted a little to relieve Hutch from his weight. Hutch looked questioningly at Starsky who bent his head. Starsky let himself go then, inviting his partner with open lips. being separated far too long. “I’ll do it,” Hutch whispered, his eyes locked on his lover’s face. the waistband of Hutch’s sweats. rid of the restrictive jeans. bring a little joy to Mrs. Thompson’s kids. would have meant an interminable separation from Hutch. all was right again in his world. exposed. “God, I love you!” he murmured -- then lowered his head. to reach their longed-for object of desire. Starsky looked up to meet Hutch’s eyes. misty-eyed nod was all the agreement he wanted to see. every moment and every act of love they performed. reached out his hand, holding on tight when Hutch grasped it and clung. spinning around him when he finally could open his eyes. Christmas tree had begun rotating again only much faster this time. places and flew across the room. into uncontrollable laughter at their predicament. “Oops,” Starsky said, blushing. “Guess it must’ve flown outa the tree. trembling as he tried to work the clasp behind his neck. Hutch pointed to the wrapped box under the tree. “Your turn, babe. of Christmas would forever live on.